It was designed to make use of standard sized electronic equipment commonly used in RC. 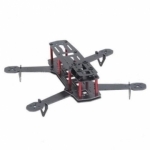 This allows the quadcopter to compete with larger quadcopters, while being smaller and agile ! Working on Mini Quadcopters requires a lot of soldering, wire shortening and creation of power distribution systems. This product requires a good knowledge of RC systems and is not recommended for beginners.